I wanted to keep track of (and improve upon) a couple of basic health-related habits this year, so that’s what I do with this thing. 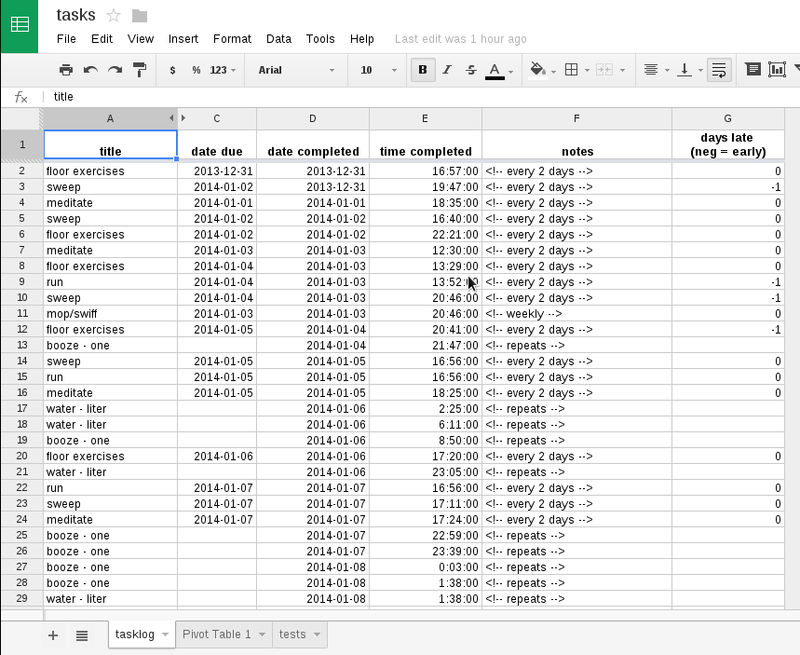 Every time I complete a task, it gets logged in a google spreadsheet. There’s even a pivot chart to track trends and whatnot. It’s been pretty smooth and swell for me so far. I’m including the code down below. Here is a Google Spreadsheet all set to go with the correct headers and even a handy pivot table to help with tracking and analysis. You should be able to save your own copy of the sheet and work from there. 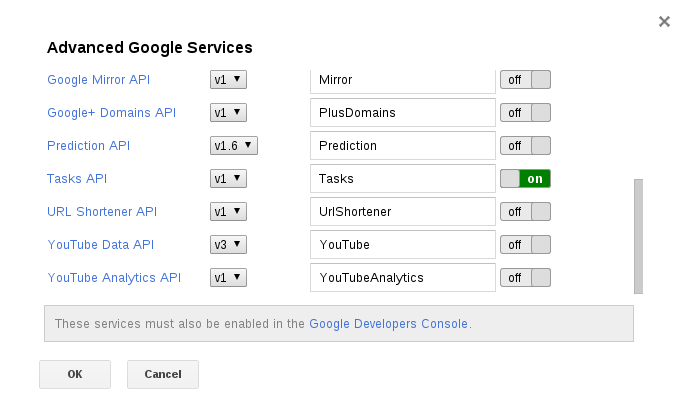 To set up your spreadsheet, you’ll have to enable the Google Tasks API. From your base Spreadsheet page, go to Tools > Script Editor, and from the Script Editor, go to Resources > Advanced Google Services. A popup displays a list of APIs. Find ‘Tasks API’ and turn it on. 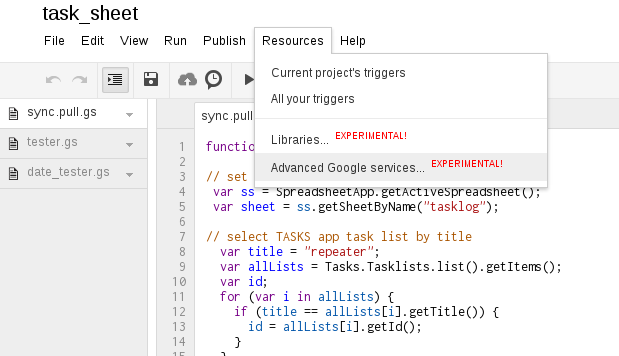 Follow the link to the Google Developers Console, where you will once again have to find the ‘Tasks API’ entry and turn it on. I’m not sure why you have to do it in two places, but that’s the way of things. In the Script Editor tab (the one that opened from your spreadsheet earlier–if you’ve closed it, get back to your spreadsheet and go to Tools > Script Editor. You may need to create a new blank script. Use the following code. Once you set those up, set a trigger. In the script editor, there is an icon of a clock. It gives a tooltip “current project’s triggers.” Click on that. I’ve got mine set to run every five minutes. Once every couple of weeks I get a “volume warning” from the Google Tasks service for posting to many requests. So you might not want to run it any more frequently than that. Every time it runs, it polls the Google Tasks service and checks your defined list for completed tasks. 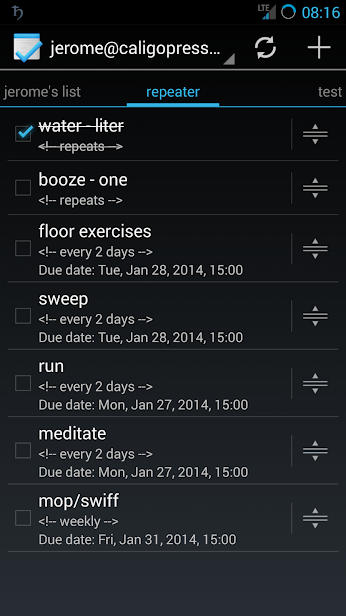 It logs any completed tasks to your spreadsheet and clears them from the Google Tasks app. So when you mark a task as complete in Tasks, don’t clear it away. The script will handle that for you. If any tasks contain a repeat tag in the description, the script sends them back to tasks. Also, check out the code on github. It’s easier to look at over there, and if you have any ideas about how to make this script better, let me know.